The coffin or casket chosen by the family is the focal point of the funeral service, and can play a part in telling the story of the deceased’s life and personality. 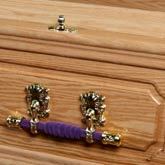 If Dad didn’t like a lot of fuss then a simple coffin with unobtrusive fittings may fit the bill. If Mum loved all things pink, then a cerise coffin – perhaps with flowers or her name engraved on the side – might raise a smile on a difficult day. Our aim is to provide a wide choice of designs to ensure that the coffin or casket chosen is right for each individual. We have coffins made from solid timbers, wood veneer or environmentally-friendly options such as willow, bamboo or wool. We know choosing a coffin is very personal so we offer a diverse range of options to choose from, to ensure you find exactly what you are looking for. 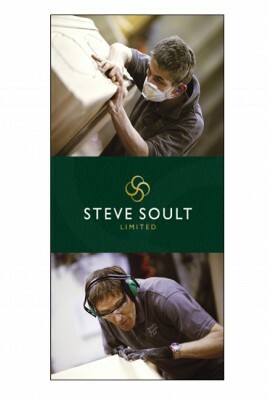 We are proud of our partnership with established local coffin manufacturers Steve Soult Ltd, based just a few miles from our premises in Kirkby-in-Ashfield, Nottinghamshire, who produce our veneered and solid timber coffins and caskets. We have chosen this company – members of the prestigious Guild of Master Craftsmen – because their mission to provide Uncompromising Quality dovetails perfectly with our aim to provide the highest levels of care and attention for the families we serve. A number of the coffins in our selection have been specifically designed by us in partnership with the team at Steve Soult Ltd, bringing together our experience of the needs of families with their expertise in creating quality products. Our close relationship and proximity to Steve Soult Ltd enables us to provide a highly responsive and individual service. Typically, when our family has made their decision about the funeral arrangements, the coffin or casket will be handcrafted for that individual to our exact specifications. When it is completed and delivered to us, the chosen interior and exterior details are added at our premises. We believe that this offers a number of advantages for the families we serve. Our bespoke range gives families the widest range of options to personalise the design and finish of the coffin, but in fact many of our designs can be adapted on request. This in conjunction with our close working relationship with the team at Steve Soult means that we’re confident of the highest quality of finish of each coffin arriving at our premises. We also work with a number of other suppliers of alternative style coffins. To see the full range of options available, please download our brochure and price list here.